Determining Appropriateness of Threatening Language, or…When is it ok to threaten someone’s child? That was the less-than-nice encounter we had as we were departing brunch last weekend. The tone of this blog is definitely tongue-in-cheek (and frequently foot-in-mouth) and I regularly like to sensationalize titles, but this was a genuinely weird moment caused by a parent’s fear for their own child’s safety. So… was it ok to threaten my child in retaliation? I’ll set the stage a little better. We had just completed our meal at the lovely Hi Life in Ballard. A restored Firehouse in one of Seattle’s cooler neighborhoods that’s near AT’s interpretive dance/rolling-around class that has great and simple All-American food (specifically Brunch): Bloody Mary’s, Biscuits & Gravy, et. al. And the best part for my GFGF (gluten-free girlfriend), most of their menu can be had Gluten-free — which was the primary reason we went. Although thinking about the super-glutened B&Gs with a sunny side up egg is starting to make me lose my train of thought. Dilemma: Help now or forever miss capturing the action for posterity? I just encountered a scenario that briefly called into question my own internal standing as Worlds Best Daddy (WBD) and I’m eager to see what my loyal subjects, I mean followers think about how I handled it. I’m confident you’ll agree WBD did the best thing for both the internet and of course my child. It was a dark and rainy night, very Film Noir (well I guess it still is because it just happened), and I had just picked AT up from daycare. She was as happy as ever to see me – meaning she was really dissapointed that mom wasn’t there, but that’s besides the point. You don’t get to be WBD by worrying about what your kids want. So as per usual at this time of night, in this part of town, with this weather, I was a bit distracted (also, I was trying to send a text message and look at google maps, but that’s neither here nor there). When out of nowhere, my precious angel changes the cadence of her scream and I can tell that it’s not about crackers. I look back and AT has spun a Chinese Finger Torture (that’s probably not very PC, sorry) with her hair and it’s cutting off the circulation to her right pointer finger. Backing up a bit, AT regularly spins her hair and it kinda drives me crazy. I used to work with a woman who I’d consider one of the dumbest and most annoying people on earth and she used to twirl her hair constantly. I associate it with stupidity and it absolutely freaks me out that my little uber-intelligent-smarty-pants could have such a “tick.” I choose to believe that there is no correlation and that the dumby I used to work with was just doing it to antagonize me personally. As Andie was obviously scared and in pain, I pulled over immediately to rectify the situation and help her untangle, but then I had a thought, perhaps she’d want me to take a photo of it? I’ve done all kinds of dumb stuff as both an adult and an adolescent, so I’m sure I must have done even dumber things as a child, yet there is no photographic evidence of this. I’d like to have photo evidence of that bean I stuck in my nose, but I’ll admit that I’m not a normal person. So her finger was getting pretty purple at this point and I don’t feel great about it, but here’s the photo. If it’s any consolation AT, I really believe you’ll be happy that I caught this for posterity. And thankfully, we were able to save the tip of your finger… and your hair. Actually cutting your hair was my first inclination, but then I remembered you have picture day tomorrow and I can’t deal with the wrath of your mom if you show up looking like some weird hipster. The moral of the story is that we are all winners. 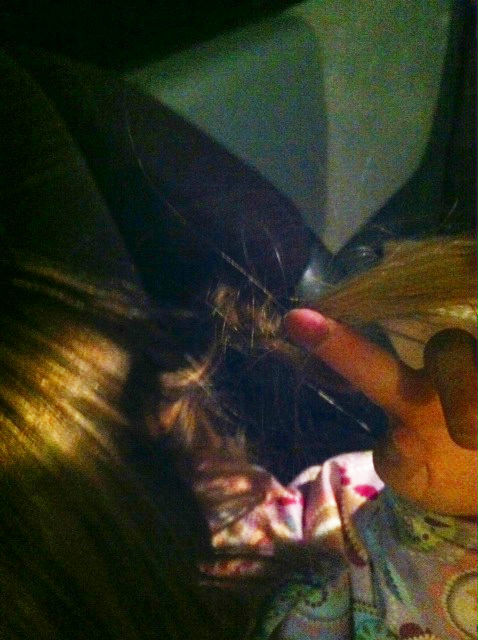 I was able to save her hair, her finger, and the image for eternity.